What Size Barbell for Bench Pressing? You know you want to do bench presses, but you’re not sure what barbell you need, or what will fit your rack. First, the length. Here’s how you figure out what length you need. 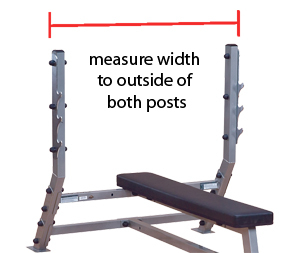 First, if you already have a bench with attached bar holders, or a power rack, measure it. What you want to measure is the width of where the bar is going to be sitting on the rack. See the diagram to the right. Be sure to measure from the outside of one side to the outside of the other, not just the inside distance. The reason for this is the inside collars of the barbell (that you slide weight plates up against) needs to be farther apart than this measurement, so that the collars are sitting on the outside of both posts. This makes it so there is no interference when you rack the bar and when you load and unload plates. So the full space between the posts is therefore available to you to grip, depending on your preference of grip width. As of writing, all of our benches and stand-alone racks are olympic width. What this means is the above measurement is going to be about 48″ wide on all of them. To fit it, you generally need a 7ft bar. A 7ft bar will always be long enough that collars will sit outside the rack. To be specific, you will have about 51-52″ of shaft on the bar, leaving a couple inches of slop in either direction so that you don’t have to worry about racking it perfectly in the center. Two inches of slop is just right. But less than an inch requires a lot of precision can can result in some nasty mishaps. You certainly don’t want to have trouble racking the bar after a heavy set where you barely completed the last rep of bench presses and need to rack the bar quickly. But there are also some shorter bars that fit these racks. All of our women’s bars, made for olympic weight lifting but fine for bench pressing too, have shorter sleeves on the ends but the usable shaft is the same length as 7ft bars. The key for most setups is to make sure the bar has at least a 51″ shaft between the inside collars. That way you can be sure it will fit on any power rack or olympic bench. Some cheap or old-style bench presses with narrow racks can use a shorter bar. Measure it as shown in the above diagram to figure out what you want. The other dimension to the size of a barbell is thickness of the shaft. There are good reasons they aren’t all the same. Generally a 30mm or 32mm shaft is perfect for bench pressing. It’s a little thicker than some other bars, but for pushing movements you should like that thickness because it doesn’t dig into your hand so much when you start getting to heavy weight. But a 28mm bar is fine too, since it’s a general purpose bar. 29mm is the official IPF spec for powerlifting competitions. As you can see, the diameter of bar for bench press isn’t as critical as it is for heavy pulling movements like deadlifts and cleans where you need a thinner shaft to facilitate a strong grip. This one by Troy is my recommendation for a budget bar for bench pressing and other exercises. The shaft is a thick 32mm, making it quite stiff and strong. The sleeves are held together with snap rings, not the hex bolts that loosen over time on economy bars. The sleeves also spin on brass bushings, which is pretty much the best spin you can get without going for expensive bearings. I don’t think you’ll find a lower price for a decent bar like this. There’s a few good reasons you should upgrade to this one over the Troy one above. It’s stronger, it has center knurling, and the shaft is thinner, making it better as an all-purpose bar that you’ll be happy with for a wide range of exercises. For a couple more suggestions, see our article on the best olympic bar under $200. Once you’re set on a bar, see JMax Fitness’s article here with excellent tips on proper bench press form, foot placement, how to grab the bar, and more.